This summer at Newman Outdoor Field will have a different air to it. Not because it is a new season with a fresh 100-game slate. Not because Doug Simunic has crafted a new roster comprised of both new and familiar faces. The 2016 season has a piece lacking from the puzzle – its voice. Scott Miller’s nearly four-year battle with cancer ended on February 25, 2016 and his absence will be greatly felt for years to come. The lack of his presence behind the mic will not only be missed because of his patented tagline, “My oh My.” It will not only be missed because of his endearing manner and descriptive ability to make you feel as if you were sitting next to him at the game. You all knew him as “The Voice” of your favorite team, while those who worked with him knew him as one of the finest men you will ever meet. First class all the way, Scott was known for putting others before himself and genuinely cared about what was going on in their lives, even in his final days. A gentle, kind-hearted man of strong faith and conviction, he hardly ever cursed. When re-telling stories Scott would spell out the words letter by letter to omit profanity from his vocabulary. Scotty was a seasoned veteran who brought the game into your living room. He was comical without effort. His inherent calls seemed so natural, so simple at times, yet, we all gravitated towards our radios on his every word. The Fargo-Moorhead radio personality of over 20 years called some of his best games while dealing with the harsh treatments of cancer. In the past five years Miller has become the only radio broadcaster in history to call five straight national championships in college football. He was also fortunate to call three big dances for a Bison men’s basketball program that is still very much in its infancy in NCAA Division-I. From Ben Woodside’s shot in Sioux Falls to Lawrence Alexander’s in Spokane, Scott Miller was the one who brought the moment to life. These days flip your television to anything NFL related and Carson Wentz will most likely pop onto your screen along with his Bison highlight tapes with background radio calls from you guessed it – Scott Miller. His voice is all over ESPN and their flagship stations following North Dakota State’s unprecedented fifth straight national championship and Wentz’s journey to the NFL. Needless to say, he saved his best for last. Scott called some of the most iconic moments in RedHawks history. For starters, three Northern League championship seasons. In his first season the ‘Hawks won it all in ’06 and then won back-to-back titles in ’09 and ’10 in the Northern League’s final two seasons before merging with the American Association. He was the man behind the Jeremiah Piepkorn walk-off grand slam call that resounds its way through the confines of Newman Outdoor Field in the pre-game video each season. In 2015, Miller was ailed by health and was only present for about half of the RedHawks games. Determined to come back, he made a push to return to the air and resumed his place near the end of July. For a couple weeks KFGO Sports Director and interim play-by-play man Jack Michaels and Scott shared the air to ease the transition back. The games were moments the two will both cherish as they are the closest of friends. It was like the Vin Scully’s and Bob Uecker’s of minor league baseball teaming up – except better – it was the M & M Boys. Scott called a pair of walk-off wins and Brandon Mann’s final push that eventually broke the American Association single-season strikeout record. The RedHawks went 21-8 over the last 30 days – a fitting way to end the season and though we did not know it at the time, Scott Miller’s tenure as the voice of the RedHawks. When sitting in your seat at Newman this summer, feel free to imagine Scott behind the microphone. If you see something spectacular, utter those three words – “My oh My.” And if you look up in the box – make sure to peer closely. You might see a flash of Scott, thumbs up and smiling with his headset secured snugly over his RedHawks’ hat. 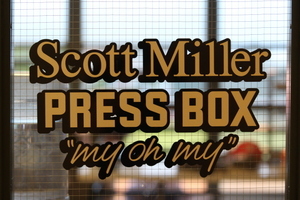 The press box is named after him because that was his home and he’ll never leave. Have you seen the movie Field of Dreams? Baseball is played in heaven - and they found their play-by-play guy. 2016 is for you, Scott. We miss you and love you. Play ball.